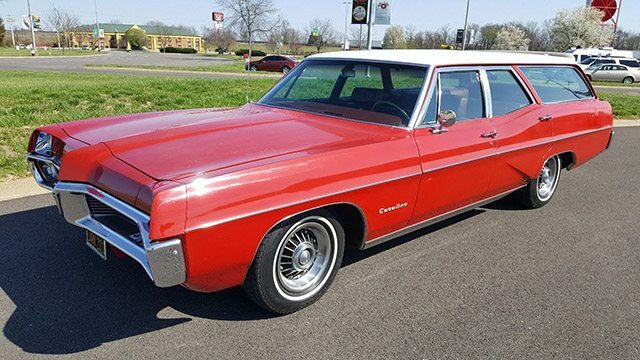 The seller of this 1967 Catalina station wagon states right away the the car has its share of ‘dings, scratches and other imperfections’ and the honesty is appreciated but this appears to be a very nice survivor imperfections or not! The red paint which is believed to be mostly original is complemented by an interesting white two-tone that covers the roof and extends to the rear pillars and to the top of the tailgate. If the nearly all red exterior isn’t enough, take a look inside and you’ll see a beautiful red interior throughout. You can find this very nice survivor on Ebay in Bowling Green, Kentucky where bidding had hit $7,100 early in the auction. Described as an unrestored time capsule this 30,679 mile Catalina wagon is certainly one of the more desirable wagons we’ve come across. 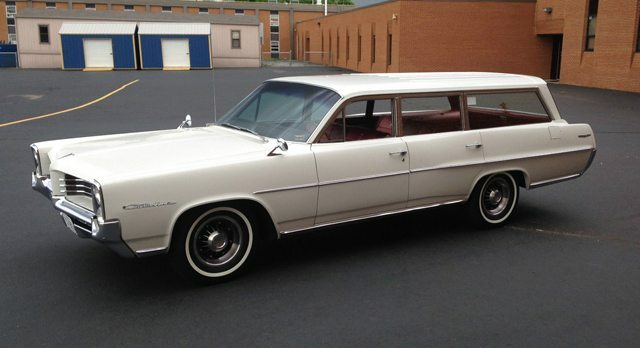 Pontiac’s crisp clean styling was in full force by 1964 and they didn’t miss a beat in executing their wagon designs. The white/red color combination looks fantastic (don’t all 60’s cars look great in white/red!) and the 8 lug wheels and 389 V8 are pure Pontiac excitement. Listed on Ebay in Wentzville, Missouri this one owner masterpiece has a BIN of $32,000. Acquired from a church estate and restored to perfection this rare Pontiac is one of the nicest 50’s era wagons we’ve featured. 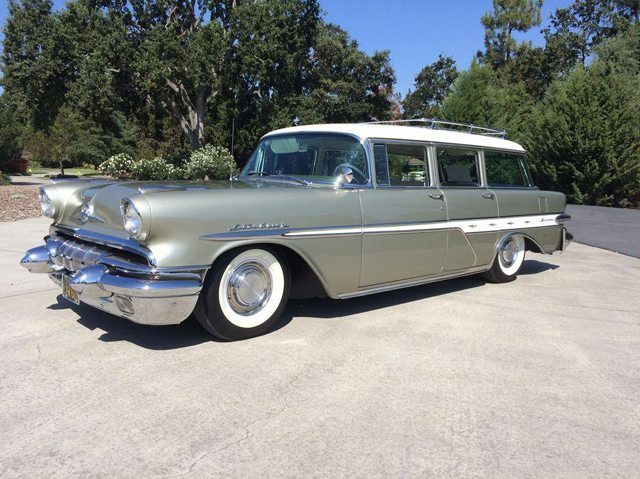 Beginning with the rarity of the car and understanding how few likely remain it’s hard to imagine that there are many 1957 Pontiac wagons as nice as this one. Officially called a Pontiac Star Chief Safari “Transcontinental,” this was the top of the Pontiac wagon for 1957. 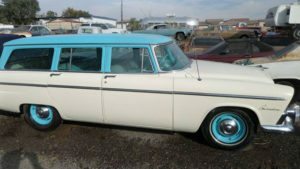 Only 1,894 of these wagons were produced and the price tag of $3,636 was second in the Pontiac lineup only to the Bonneville convertible that was priced at a hefty $5,782! 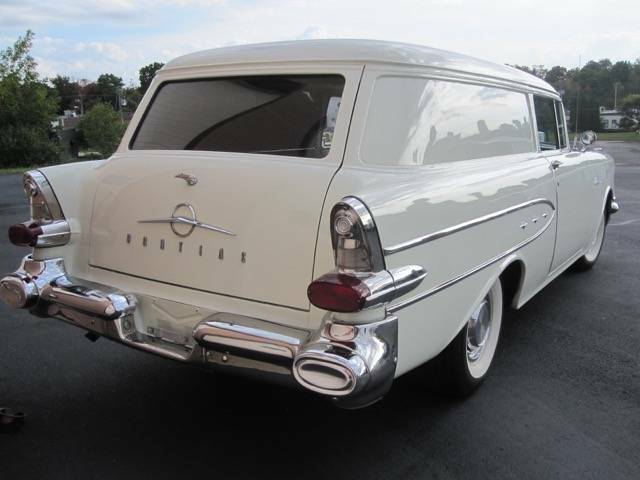 You can find this fine wagon on Hemmings with a $41,500 asking price. 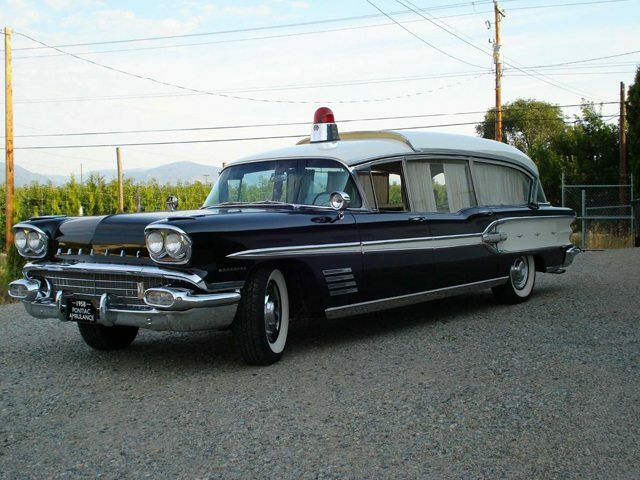 This Superior body conversion 1958 Pontiac ambulance has just 23,000 original miles and is said to be 100% original. 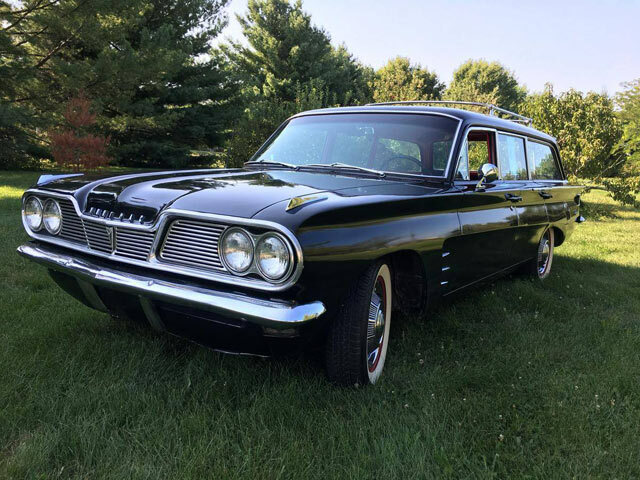 By their nature service vehicles are subject to wear and tear and even ones with low mileage will typically show use beyond there stated miles but the black paint and chrome gleam on this Pontiac like the day it rolled out of the factory nearly 60 years ago. One has to winder the history of such an exceptional vehicle but suffice it to say it likely had a couple of years of service before being retired. 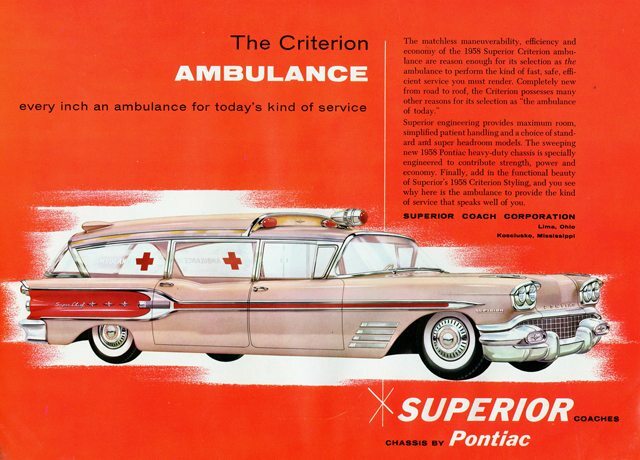 Not a practical car beyond it’s use as an ambulance it likely ended up in storage before ending up in collectors hands years later. This unique and exceptional ambulance is listed on Craigslist in Langley, British Columbia with an asking price of $31,000. 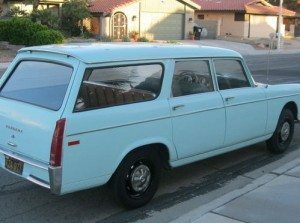 A first look at this Pontiac Sedan Delivery and one would surely think this is one sweet custom, after all Pontiac wasn’t making sedan deliveries in the late fifties right? 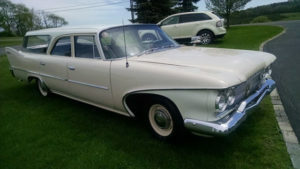 Well, in Canada you could purchase one but even there they were a rare sight as General Motors of Canada only produced 857 sedan deliveries in 1957. With such a low number produced there can only be a handful left today making this one the rarest of the rare. The example here which can be found on Hemmings and located in Waterloo, Ontario is described as being ‘sympathetically restored as new.’ All the sheet metal is described as original with a high quality paint re-finish in ‘Imperial Ivory.’ The chrome and stainless are a combination of NOS parts and re-plating. 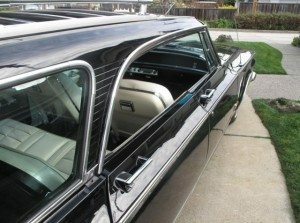 The interior was restored in correct original Black/Charcoal cobblestone cloth and the rear cargo department is described as being well detailed. The power plant is the original 6 cylinder 261 cid with 3 speed standard shift on the column and equipped with overdrive. Mileage is showing just over 50,000 which the seller says lines up with the condition of the car. There is no price listed by the seller as the listing shows ‘inquire.’ Given the rarity and quality of the car this beauty won’t come cheap.